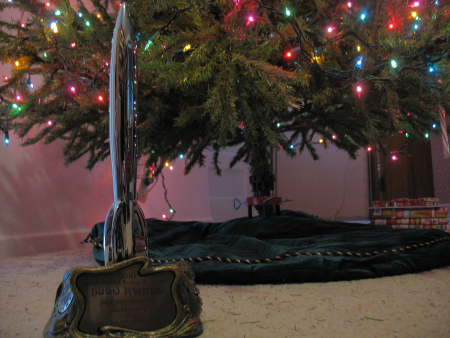 Clarkesworld Magazine‘s Hugo Award arrived today. Can’t wait to show the kids! I tried. I may take down the tree and decorate the rocket instead. Yay, Neil! Very nice topper on a good year, even if not on the tree. The last couple of weeks have been something else. 2010 is really going out with a bang. And very pretty! Congrats again. Full circle. I voted for it. I saw it presented. I took a picture of it in Melbourne with Cheryl sitting behind it at her computer in the huge convention centre hall at some ungodly hour in the morning, and here it is! How cool. Congratulations again. Thank you, all the way around! What a beautiful Christmas present. Congrats. That is an awesome trophy. So totally cool. Huge congrats, and well deserved!